Sunday morning again. And the count-down for Christmas has started. In the middle of the week the Becketts returned to Australia for a family celebration. So in their absence Ruth and I step in to do the teaching at the School for Officers Training. We like it very much even if we have to put a number of other duties aside for two weeks. I am teaching doctrines and Bible and Ruth is teaching pastoral care and Leadership. In the middle of the weekly Finance Board meeting one of the staff members came in reporting that the police had come to our office to make some investigations about our flag outside the house. Our economist went down to meet the police. It showed that somebody had made a complaint about our flag. We did not have the building permit available at the office. At the time the permit was with the builders re-building our entrance. We promised that we should have the permit at the office the next day and the policeman promised to come back the next day. He has not come back yet.. During the visit the policeman said that it was quite a challenging text on the flag. 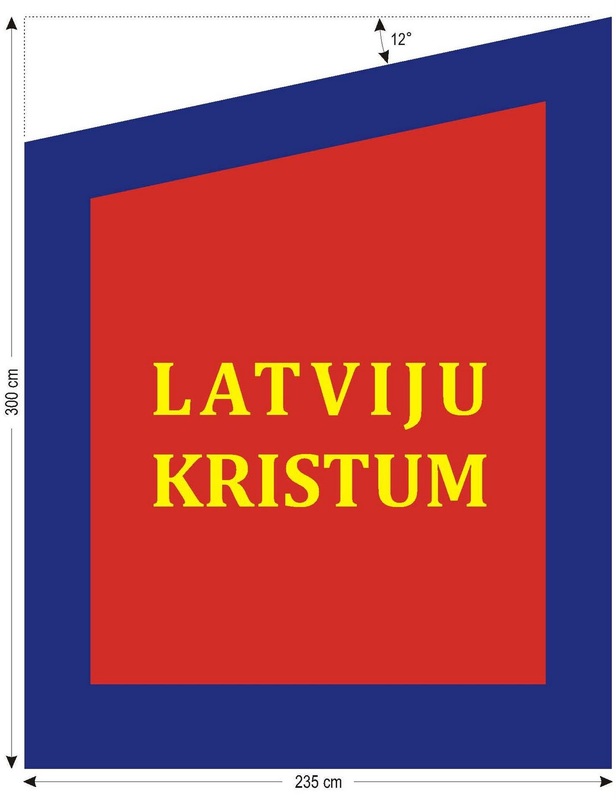 The text is "Latvia for Christ". We know it is challenging and we want it to be challenging. This is a very special weekend for us. All our family is gathered in Riga due the 40th anniversary of our oldest son. All three sons have arrived with their families. Five grandchildren and totally thirteen peoiple. These meetings do not happen very frequently because we all live far away from each other. But when these meetings happen we really enjoy them. Now it is early Sunday morning and we all plan to go to the meeting at Riga first corps. At the service we will contribute with a cornet-trio played by three generations. Son, father and grandfather. Soon this weekend will be over and a new work week will take over. In the beginning of this week we received many thank-you mails from people participating in our 20 years anniversary of the Salvation Army work in Latvia. Someone expressed it like this: "This is as much Salvation Army there can be. Many young people in uniform, soup-kitchen, brass band, War Cry and joyful meetings". Many people have also expressed appreciation for our great staff. To be able to handle the logistics when the house is filled with twice the amount of people that could normally fit into our premises. To feed more than 400 people in less tha 45 minutes with no feeling of hurry or of being crowdy. We just agree. We have a large group of enthusiastic young people with the attitude than nothing is to difficult. We look back to the event with great gratitude and I believe it is important for us to create celebrations like this. It strengthen the feeling that we are a lot of people being together in this work. Especially for those coming from small villages with few people in the corps. But when the party is over the work continuous in the many different Salvation Army operations in Latvia. Soup-kitchen, distribution of clothes, showers, washing clothes, Bible studies, prayer meetings, recruit meetings, home visits and meetings. This is our vision and for this we live. This week has of course been dominated by the 20 year anniversary of the re-start of the Salvation Army work in Latvia after fifty years of occupation. It has been a race with time. Four o´clock in the afternoon, the day before the celebration, the flag-pole with the three meter long flag was put up (see picture above). The flag totally changes the overview of the Bruninieku Street and it boldly proclaims "Latvia for Christ." Nine o´clock in the evening the new entrance door was put in and a part of the big board covering the entrance side of the building was taken away, so people could enter for the Celebration the coming day. When the builders left the building late at evening our people could start cleaning the entrance and the stairs up to the Main Hall. Out on our yard they put up tents and benches for the "old fashioned soup ktchen" which would be served outdoors between the meetings. We had re-arranged our main Hall and put in extra chairs so it could receive 350 people. But we knew it would come much more than 400 people for the celebration. So we borrowed extra chairs in our neighbour Russian School and filled our cafeteria with seventy extra chairs and arranged a wid-screen to make it possible to follow the meeting from the cafeteria. And the people came! It was packed with people sitting and standing everywhere. And the people stayed for at least five hours during the two meetings and the soup served between the meetings. The meetings also included a farewell part for commissioners Vic and Ros Poke who visited Latvia for the last time before their retirement. Durign the day of celebration there was also an exhibition showing the Salvation Army history in Latvia from 1923 to 2010. 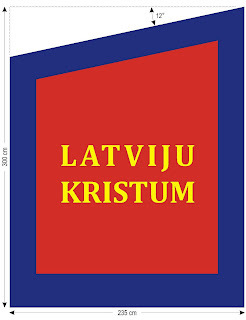 The Latvian War Cry, the first issue since World War 2, was sold in Latvian and in English. The following day there was a "Spiritual Day" at the Training School with Vic and Ros Poke. Now it is Sunday morning and soon it is time to go down to the next Celebration. Today is the corps, Riga 1, celebrating their twenty years of ministry in Riga. After that it is time to try to come back to a normal life after all celebrations. 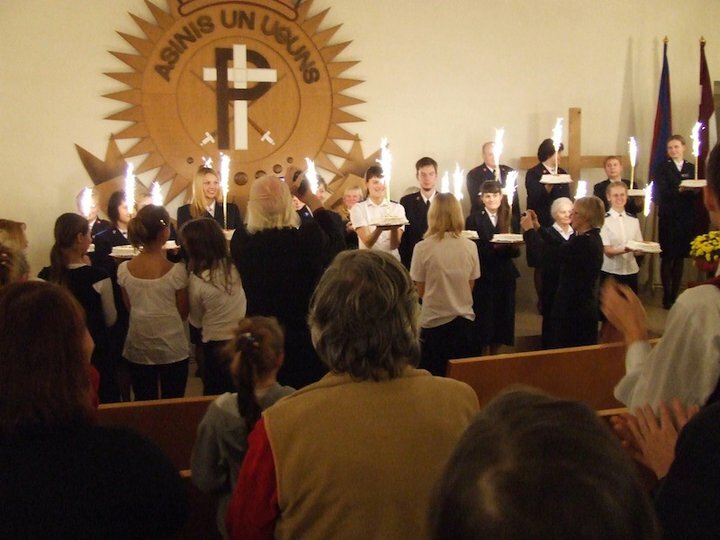 The 18th of November 1990, the National Day of Latvia,The Salvation Army held its first meeting after the occupation. Now, twenty years later we celebrate the birthday party and the work during twenty years. The day started with a banquet at the Training School for specially invitated guests from abroad. The Training School Principal made the food and the cadets were serving at the tables. During the banquet a drama was presented showing the history of the Salvation Army in Latvia from 1923 to 2010. On the afterneen two meetings were held. The Hall was packed. Even the cafeteria outside the Hall was packed and the people sitting there could follow the meeting on a wide screen. Between the meetings soup was served from on old-fashioned soup-kitchen. It was a non-stop celebration between 14.00 and 19.00. The second meeting ended with cakes and coffe. Twenty people were marching in with twenty cakes with fireworks. The cakes represented the twenty years of minitry in Latvia. Every cake was carried by a person who became a soldier the year his/her cake represented. It was a great ending of a great day. 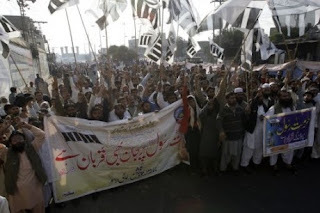 When the celebration was over several participants had a three hours drive back to their cities and villages. More information about the celebration will come on "Early Sunday morning". On Monday we will publish a lot of pictures from the Celebration. From my personal view-point in the middle of the week. Now we have passed the middle of October and the darkness is getting more and more heavy outdoors. But indoors there is light early in the morning and late in the evening from people preparing for the Latvian Salvation Army 20th anniversery. The builders are having a hard race with time to make it possible to use the entrance to Riga first corps for the hundreds of people who will attend the two services on the celebration day, the 18th of November. The choirs are struggling to have the music in order for the great day. So also the tamburines and the brass band. Greetings are coming in from different people to the celebration. The social institutions in Gothenburg have bought a flute, which is on the wishing list for a cadet at the Training School. The Band from Lidköping in Sweden is sending their greeting: "The Salvation Army Band in Lidköping is sending a greeting to your 20th anniversary the 18th of November. We remember with great thankfulness our visit to RIGA during Easter time 1993 with services in the Hall, open air music and a visit to the prison for women." It will be an exciting day with many guests and a full program. Last weekend Ruth and I were in Fristad, outide Borås in Sweden and had a weekend at the local Mission Church. My sermon is recorded and you can listen to it here (in Swedish). If you want to listen to the cornet trio by three generations, son, father and grandfather, you can see and listen here. During the weekend the congregation made an offering for the work in Latvia. The result from the church was more than 10.000 SEK ($1.500). Great result! Another week is soon over. It is now the middle of November and it is getting really dark during the days. Wednesday evening Ruth and I went over to Riga second corps to take part in the wednesday meeting. As usal the hall was full and the majority of the people were homeless. About twenty recruits and soldiers helped with the practical arrangements. Many of them with visible signs of a former life with alcohol and homelessness. It is great to see these people who have been restored and transformed inte a new life. The services at Riga 2 are in Russian, and fortunately one of our favourite cadets, Karina, came down from the Training School to help us with the translation (we have nine favourite cadets, one of them studying in London). This week I have started to read Exodus in my persoanl daily devotion. Again I can see how Gud saw the suffering people who were slaves in Egypt and how He heard their cries for help. God´s solution to the problem was to find a person who was willing to obey Him and deliver the people from slavery. God chose Moses to this mission. Also today God hears the cry from the suffering people and he sees how they suffer. The question is if He finds somebody today willing to obey Him and deliver the people. Moses did not think he was a good match for this mission. He did not think he was good enough. He did not think he could do anything. He thought he was lacking the resources necessary for this mission. Then God told him to use what he had and asked him "What is that in your hand?" (Ex 4:2). God did not expect Moses to use what he did not have. If we give what we have into the hands of God, he can transform that to something great and use it to transform people´s lives. This Sunday morning I wake up in Frufällan in Borås. We are doing a teaching weekend in the Mission Church in Fristad and in a few hours it is time to go to the Sunday morning service where I will preach. A very special bonus this weekend is that we are staying with our eldest son and his family and I have the opportunity to hug three grandchildren who all grow a lot between the rare occasions I am able to meet them. After the service we will drive directly to Arlanda airport (five hours) to fly back home to Riga and to an extremely busy week with the twenty years anniversary of the Salvation Army re-start in Latvia after the liberation. Ruth often says that it will be less stressful next week. We will see about that. At the morning service today we will perform some music by our family. We will play a cornet-trio by three generations. Son (10 years), father (40 years) and grandfather (older than the other two together). Here is a short cut from the only practice before the performance. What kind of service do you expect on Sunday? The Salvation Army is today working all over Latvia in 12 corps (churches), orphanages, a crisis centre for women, after-school activities for children, visiting ministries and social centres. Almost all of the corps have an extensive social work, for example soup kitchen, food parcels, clothes distribution, showers and washing machines. 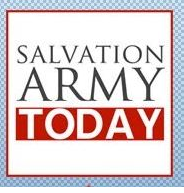 The Salvation Army is a church and the main objective is to preach the good news about Jesus for all people in Latvia, children and adults, rich and poor. The motto is “Blood and Fire”. “Blood” refers to Jesus giving his life on the cross to give us forgiveness and Salvation. “Fire” refers to Pentecost where the disciples were filled with the power of the Holy Spirit. SALVATION Army medical workers are providing assistance to people affected by the eruption of Mount Merapi in Indonesia. At least 64 people are known to have lost their lives in the disaster and an estimated 75,000 people have had to be evacuated from their homes, with many now living in temporary camps. An assessment was carried out by personnel from the William Booth General Hospital in Samarang and The Salvation Army's Java and Bali Divisional Headquarters. They reported that the government is providing meals, shelter and general health services but that there is an urgent need for nutrition and milk for children, and for health provision for children, nursing mothers and pregnant women. My personal reflections from my view-point in the middle of the week.. Right now intensive preparations are going on for the twenty years anniversary of the Salvationa Army re-starting in Latvia after the occupation. The Festival will take place the 18th of November, the national day of Latvia. You can hear people practice in all corners of the building. Tamburins, Choir and Brass Band. The builders working with the new entrance to the Riga 1st corps are working late all days of the week. Preparations are also going on of the exhibition, the drama and the publishing of the Latvian War Cry . ...and the Social Center is situated in the corner between Avuto iela and Stabu iela and is right now preparing for the official opening the first of December. Dreams are coming true! I believe that God has heard the desperate prayers from the children in Sarkani and from the poor people in Riga. The coming weekend Ruth and myself will have meetings in the Mission Church in Fristad. Our oldest son and his family are active members in that church. On the Saturday we will have meetings informing about Latvia and on the Sunday we will have the service in the church. During that service we will play a cornet trio, played by three generations. Myself, our oldest son and his second oldest son. I look forward to that. "And will not God bring about justice for his chosen ones, who cry out to him day and night? Salvationists from nations around the globe are being called to united, focused intercession - the need for justice for the oppressed: a day-and-night cry for justice, starting 1 January 2011 and continuing indefinitely. Sign up now to register your participation in this global prayer initiative. Bishop Peteris Sprogis, the executive chair of the Ceribas Festivals with Franklin Graham, recently talked to Decision Magazine about the past and present challenges of the church in Latvia, and why he believes that God is doing great things in this Baltic nation of some 2.2 million people. Learn more about the Festival that will be held Nov. 5-7 at Arena Riga in Riga, Latvia. Q: Could you briefly explain the recent history of the church in Latvia and the obstacles it has overcome? A: It’s a complicated history. The hardship of 50 years of Soviet occupation protected churches in Eastern Europe from the humanism and secularism that affected the West. However, the church in Latvia became ingrown because it had no dialogue with the outside world. It was unable to reach out because it was focused on protecting itself. So the castle has now become a prison, and the door is locked from the inside. But the church is not called to operate in a perfect world. We are called to bring the Kingdom of God to a hurting world. Today, we have new challenges and opportunities. We are facing the same problems that weakened the Western church—post-modernism and materialism. But I am optimistic because this creates a kind of desperation to look for genuine Christianity. The world is looking for a church that has answers.